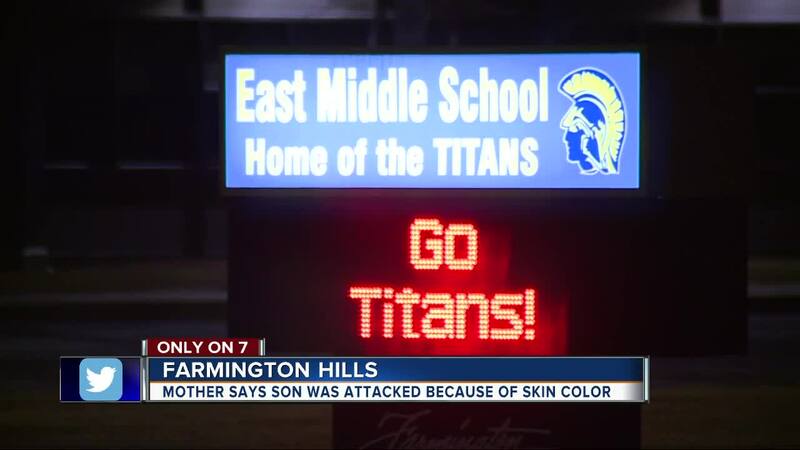 FARMINGTON HILLS, Mich. (WXYZ) — A mother is sounding the alarm after she says her son was attacked by several students because of the color of his skin. It happened Tuesday afternoon as her son was walking home from East Middle School in Farmington Hills. Jennifer Salter says her son was being called names including the “N” word then attacked by three white students. "He was targeted because of the color of his skin," Jennifer Salter said. Salter says her 6th grade son Quintez is still confused and frustrated about why something so violent and cruel happened to him. "He’s never experienced anything like that. So it was definitely a reality check for him and maybe some other people in the community too," she said. Jennifer says her son was attacked by three white boys Tuesday afternoon on his way home from East Middle School in Farmington Hills. "The one boy involved was shouting the N-word. At one point or another he picked my son up and slammed him to the ground several times," Salter said. She met with the assistant principal and told him what happened to her son. "He was very very sympathetic and he was very apologetic," Salter said. The school district completed the investigation. One student, a 7th grader, was disciplined for his behavior. After the investigation, it was determined discipline was not necessary for the other two students. The parents seem at peace with the outcome. "They put in place a program to kind of teach the boy and give him opposition learn where he went wrong," Salter said. In 2017, there was another incident at the school. This time involving a teacher and an African American student who wouldn’t stand for the pledge of allegiance. That incident ended with the teacher being placed on administrative leave. "I just hope that people change. Change how you love your kids, change how you teach your kids and just be aware," she said. Jennifer says her son is strong and determined not to let something like this from preventing him from learning and growing at school.